NEWINGTON – After a long election night stretched into the early morning hours, it was finally announced that Democrat Gary Turco won the 27th District race by 66 votes this week. He and his opponent, Gary Byron, a Republican seeking a third term in the seat, had very little sleep overnight. “I’m exhausted but it was so worth it,” Turco said Wednesday morning. Newington Registrars of Voters Marie Fox, Linda Cultrera and their staff finished an absentee count by 3:45 a.m. with the help of volunteers. The ladies reopened the office about six hours later to a flood of phone calls and visitors. “We’re recounting everything again to make sure it’s correct,” Fox said, clarifying that this process was not a mandatory recount just staff double-checking their own work. An unofficial total of 10,916 votes were counted, Turco receiving 5,491, or 47.77 percent, and Byron, 5,425, or 47.37 percent. The winner plans to have personal conversations with Newington officials, his fellow incoming state legislators and residents before the new session begins Jan. 9, 2019. Byron is still Newington’s representative until the new year, he pointed out. At the gathering of Newington Republicans Tuesday night, Byron thanked local residents for their support, while still uncertain of the final results. On Wednesday, Byron said, “It has been the opportunity of a lifetime to serve you in our House of Representatives these last four years. I enjoyed listening to what is most important to you and worked hard seven days a week to attain your goals and our town’s goals. “I am very proud of never voting for any tax increases and fighting to protect our most vulnerable citizens. These should be two priorities our next legislature works to achieve. I congratulate my opponent and encourage him to put his partisan politics aside for the good of our state and community. Although most of Newington lies with the 27th District, its southernmost section is part of Districts 24 and 29. Democrat incumbent Rick Lopes beat Republican-pick Sharon Beloin-Saavedra for the 24th District seat, representing New Britain and Newington. Democrat Kerry Szeps Wood won the 29th District seat by 55.68 percent, emerging the clear favorite of voters in southeastern Newington, Rocky Hill and Wethersfield, just 44 percent of which preferred her republican opponent Andrew Lanciotto. 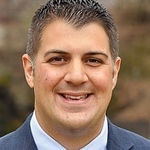 Democrat Matt Lesser was elected state senator of the 9th District, representing Newington, Rocky Hill, Cromwell and Middletown. He defeated republican Ed Charamut. U.S. Sen. Chris Murphy easily won the 6th Senate District over republican newcomer Matthew Corey. Newington voters especially favored Murphy, who has held the seat since 2013. Congressman John Larson was also reelected to the first congressional district based in Hartford. Posted in Newington Town Crier, Newington News on Wednesday, 7 November 2018 14:25. Updated: Wednesday, 7 November 2018 15:09.